Barry Clark, of the Oklahoma Department of Commerce, spoke to the Collinsville Chamber of Commerce monthly general meeting Thursday. He stated that 80% of new jobs come from existing businesses which is why efforts to support business retention and expansion are so important. Attraction of new businesses to Oklahoma accounts for only 10% of new jobs but is crutical also. He stated that the trend of migration from metropolitan areas to rural is expected to continue. He says Collinsville's "special look" is unique and praised the progressive mode of the city and Chamber and Main Street organizations. 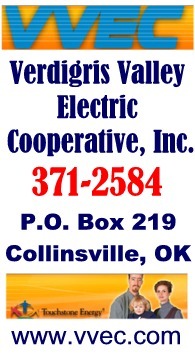 Collinsville is the eastern most city in his Dept. of Commerce territory which extends into western Oklahoma.